Diwali is not just the season of bashes but it is also the festival of traditions and rituals. Besides the lavish parties that the fraternity members plan, there is also family customs and traditions that they religiously follow every year. Earlier, we saw the Dhawans’ get together at their residence. 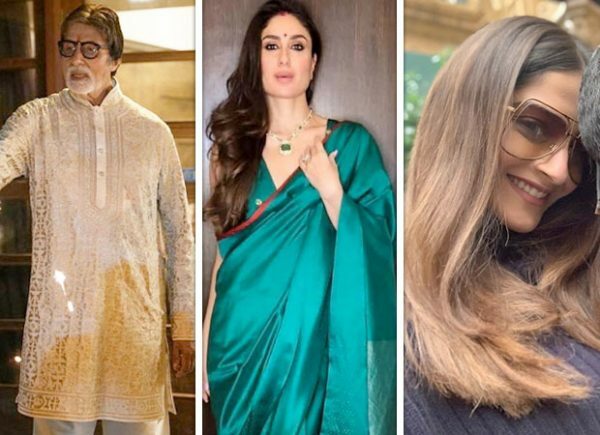 Now, here’s another series of celebrities who had a fun Diwali. No, we aren’t talking about the glamorous Diwali bash of the Bachchans where there is ample of food and fun card sessions. This one was a small family celebration, pictures of which were shared by Amitabh Bachchan on his Instagram page. 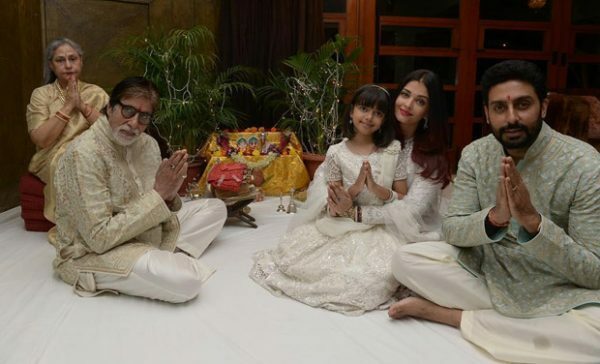 The megastar enjoyed the festivities with his wife Jaya Bachchan, son Abhishek Bachchan and daughter-in-law Aishwarya Rai with their daughter Aaradhya. The Bachchans were seen performing Laxmi Puja and then were also seen bursting crackers at their bungalow gallery. This Diwali was all about sister bonding for the Kapoors. While this year the Kapoors faced a major loss in their family, with the sad demise of the matriarch Krishna Raj Kapoor, the Diwali for them has been quite low key. 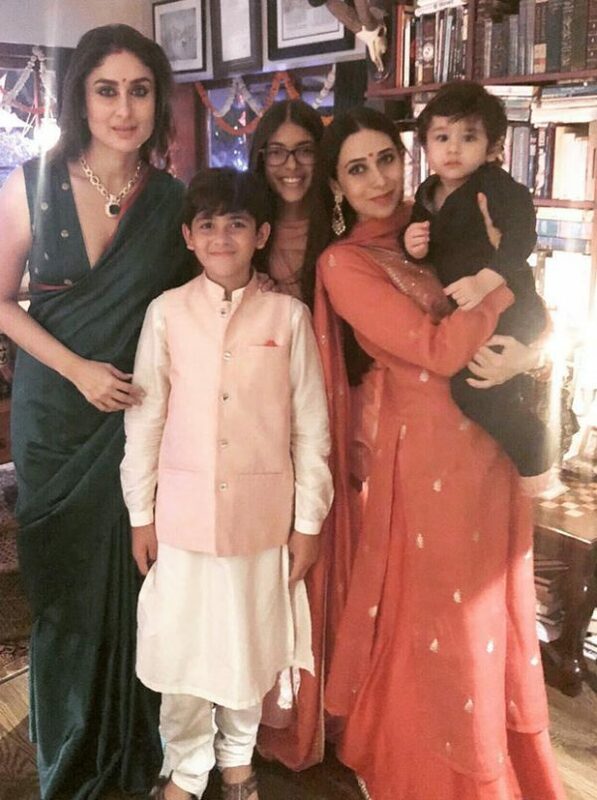 While Rishi Kapoor and Neetu Kapoor are in New York currently and missed out on annual family celebration, Karisma decided to plan a small bash for her sister and their kids. Pictures of the same were shared by the actress on her Instagram page. She is seen posing with Kareena Kapoor Khan, her own kids, Sameira Kapoor and Kiaan Raj Kapoor, and of course, the most popular star kid Taimur Ali Khan. Not surprisingly, the Kapoor ladies add ample glam to the family celebrations. We hear that Kareena’s sis-in-law Soha Ali Khan and her hubby Kunal Kemmu too were a part of the bash. Two days ago, we had shared that the entire Kapoor khandaan including Sonam Kapoor and Anand Ahuja have taken off to London. While they had ample famjam moments during their recent trip, it seems that the newlyweds decided to stick to traditions this Diwali. 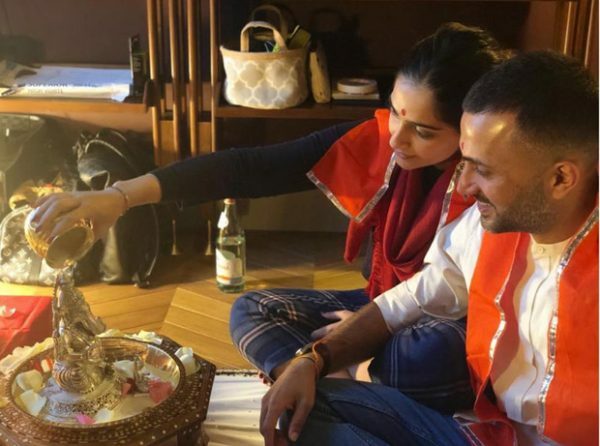 Interestingly, this is the first Diwali of Sonam Kapoor and Anand Ahuja after their wedding and we saw them seeking the blessings of the Lord as they were snapped doing a puja recently. Picture of the same was posted by Sonam on her Instagram page where she also wished her fans on the joyous occasion. Also Read: Varun Dhawan celebrates Diwali in style and here’s the proof! What Do These Three Women Have In Common? Massimo Dutti Opens First Store in North America…in Toronto!